Providing you the best range of underhung bridge crane with effective & timely delivery. Underhung Bridge Crane provided by us has excellent functionality and is notable for its high load bearing capacity. 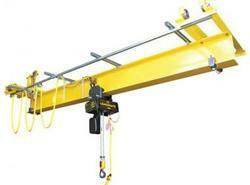 It has several advantages over traditional crane and differs from top running system. It is considered to be an apt and economical choice for bulk material handling and is made with use of best grade material and latest techniques at our end. Our range is able to operate in hassle free manner for long time period and the team of quality inspectors does rigorous inspection of the entire gamut prior to delivery in the market.